The harsh climate of Arabia, periodically interrupted by more "green" periods has probably meant that the population living there has occasionally been driven out as climate deteriorated, with new populations moving in as climate improved. In more recent times, technological invention (e.g., the camel, the deep water well, or even more recently the discovery of oil) has allowed people to subsist in the desert a little more "comfortably." 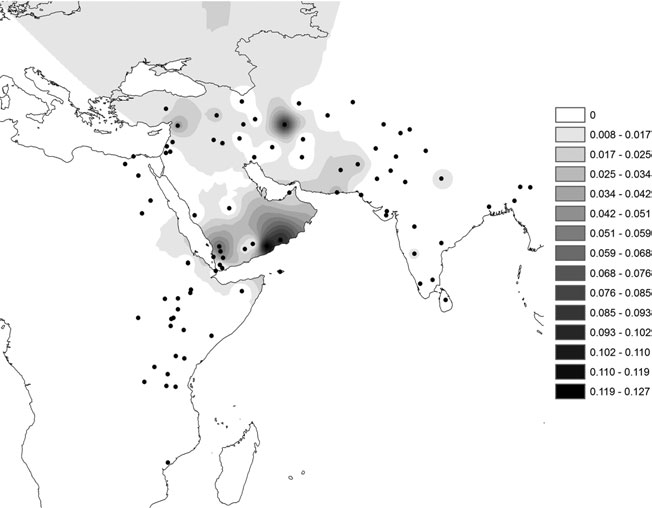 One interesting question is whether the current Arabian population derives entirely from early Levantine Neolithic peoples, or also from people who had ventured there prior to it. 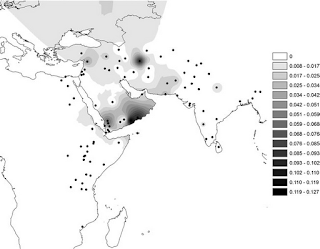 A new paper in AJPA suggests that living Arabians are not entirely the descendants of Neolithic peoples, but also preserve signals of pre-Neolithic input from the Near East, by studying the mtDNA haplogroup R2 (see map on left for its current distribution). It is noteworthy, however, that these pre-Neolithic sites do not bear any technological traits analogous to Terminal Pleistocene (Epipalaeolithic) assemblages found in the Near East. The only germane possibility of a connection between Arabia and the Near East during this period comes from the Faw Well site at the western edge of the Rub’ Al Khali (Edens, 2001). Although undated, the Faw Well lithic assemblage bears a close resemblance to the Late Ahmarian of the Levant (20–17 ka). Perhaps it was this, or a subsequent pulse from the Levant, that provided the demographic input expressed by the genetic lineages documented in this article. The results from the three analyzed southern Arabian clades do not support population continuity from the first occupants more than 50 ka ago (Fernandes et al., 2012) but do suggest some continuity across the Pleistocene- Holocene boundary. Our analysis indicates that the observed population expansion 13–12 ka is probably the result of genetic input from the Near East a few thousand years before the (debated) arrival of the PPNB culture in Arabia. If, however, there was a population expansion southward through Arabia some 13–12 ka, we have not yet found its archaeological signatures. Both regions exhibit stone tool technologies with some overlapping features, so it is warranted to suppose that we may one day locate a firm link between southern Arabia and the Near East sometime during the Late Pleistocene. Given the vast amount of unexplored territory in Arabia and paucity of archaeological sites with numerical ages, future investigations (both archaeogenetical and archaeological) throughout the Peninsula will undoubtedly serve to shed more light on this question. It is now known that several population movements have taken place at different times throughout southern Arabian prehistory. One of the principal questions under debate is if the Early Holocene peopling of southern Arabia was mainly due to input from the Levant during the Pre-Pottery Neolithic B, to the expansion of an autochthonous population, or some combination of these demographic processes. Since previous genetic studies have not been able to include all parts of southern Arabia, we have helped fill this lacuna by collecting new population datasets from Oman (Dhofar) and Yemen (Al-Mahra and Bab el-Mandab). We identified several new haplotypes belonging to haplogroup R2 and generated its whole genome mtDNA tree with age estimates undertaken by different methods. R2, together with other considerably frequent southern Arabian mtDNA haplogroups (R0a, HV1, summing up more than 20% of the South Arabian gene pool) were used to infer the past effective population size through Bayesian skyline plots. These data indicate that the southern Arabian population underwent a large expansion already some 12 ka. A founder analysis of these haplogroups shows that this expansion is largely attributed to demographic input from the Near East. These results support thus the spread of a population coming from the north, but at a significantly earlier date than presently considered by archaeologists. Our data suggest that some of the mtDNA lineages found in southern Arabia have persisted in the region since the end of the Last Ice Age. HAPI-UR: a revolution in phasing speed?